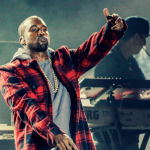 Kanye West’s history with The GRAMMY Awards? 56 nominations and 21 wins, but those are just the numbers. He’ll return to the award show this weekend for not one, but two performances. One which is being described as a “never-before-seen solo performance,” the other being the live debut of his collaboration alongside Paul McCartney and Rihanna. Sharing the stage with The Beatles legend and the once-again toast of pop music, the trio are expected to perform “FourFiveSeconds,” the lead single off Rihanna’s new album which came to life this morning with a well suited music video. This weekend’s GRAMMY awards will also feature performances by AC/DC, Lady Gaga with Tony Bennett, Ariana Grande, Common with John Legend, Pharrell Williams, Adam Levine with Gwen Stefani, Sam Smith and many more. Hosted by LL Cool J, the show will air Sunday, February 8th live on CBS.